We’re excited to announce Sister Connection’s new look! The new logo and website are an exciting step forward as we press on in the journey of restoring hope to the widows of Burundi. Sister Connection has been ministering to the needs of widows and orphans in Burundi for 10 years now. From humble beginnings in 2006, the vision has been the same- to help widows find healing from the past, dignity for today, and hope for the future. A complete site for vocational training on Mount Hope with agriculture, livestock, and 6 buildings with running water and electricity. With such profound progress fueling us from behind, we are eagerly straining toward what lies ahead. Our continual desire is for the flourishing of Burundian widows, and of every partner who has given their resources of time, finances, or energy to Sister Connection. Through the years we have strived to adapt to the needs expressed by those we seek to serve. When we arrived in Burundi it was on the heels of the end of an unthinkably violent war. Now, that war is 10 years in the past. As we are seeing healing and restoration in many widows, we recognize a shift from the struggle to recover from the trauma of war, to the rebuilding life in the present, and hope for the future. Sponsorship is still at the heart of Sister Connection. And while you won’t see our vision to restore hope to the widows of Burundi change, we believe the continued development of vocational training programs and the micro-enterprise initiative will be a primary way to restore that hope. With Sister Connection’s new look we want to celebrate the past, and look forward to all the work there is yet to do. Because of faithful partners like you, the future is bright. 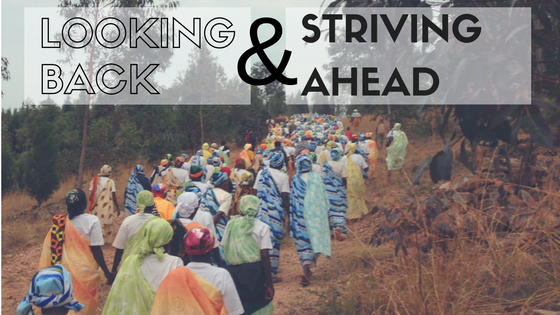 We hope you’ll continue alongside of our Burundian sisters in this exciting next chapter and continue to restore to them healing, dignity, and hope.